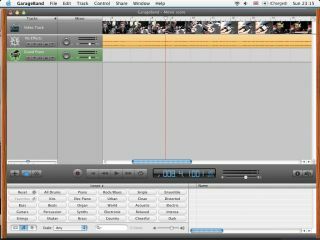 Like iMovie '09, Apple has given the '09 version of GarageBand a major overhaul. Yes, you can still make music with it. But now, HD instructional videos will teach you how. "Basic Lessons let you learn the fundamentals at your own pace," says Apple, "with instructors in beautiful HD video synchronised to animated instruments and notation. Artist Lessons feature original artists showing how to play their hit songs with everything from finger positions and techniques to the story behind the song." This is where GarageBand '09 starts to get interesting. You can sit back and let Sting teach you how to play 'Roxanne' or watch Fall Out Boy's Patrick Stump as he walks you through 'I Don't Care'. You can even adjust the speed of playback. These lessons aren't included as standard, however. They're purchased from the new Lesson Store inside GarageBand '09. Other featured artists include: Sara Bareilles, Colbie Caillat, John Fogerty, Ben Folds, Norah Jones, Sarah McLachlan and OneRepublic's Ryan Tedder. GarageBand '09 also includes exciting new guitar amp and stomp-box effects, legendary guitar rigs, plus a feature called 'Magic GarageBand Jam' that lets you play along with a virtual band. iLife '09 will be available at the end of January and costs £69 ($79).